Ensure that your planting process is successful every time by getting back to basics. Quality preparation makes for strong, long-lasting plants. Taking the time to plant flowers, vegetables, and fruit properly will pay off later. Prosperous gardens and container plants require quality soil. Clay, rocks, and sand present problems when planting, so avoid soil containing these obstacles. To be safe, test soil before planting as well; a pH balance of 7 is preferable. If your reading is lower than 6.5, the soil is highly acidic. Mix ground sulfur in with the soil before planting. Meanwhile, ground limestone neutralizes the alkaline in soil with a pH reading higher than 7.5. 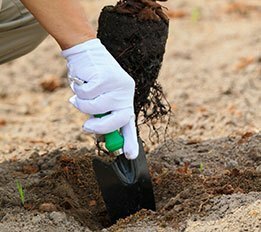 Even fertile soil needs to be loosened; make sure that the top six-inch isn’t too dense to accommodate plants. As with humans, healthy plants require nutrition. We’re told to eat our vegetables, and plants themselves also benefit from organic material. Mix decomposing leaves and plant matter into soil a few weeks or months before sowing if you want faster-growing, hardier produce. If you’re short on time, or just want to maximize the richness of your soil, add store-bought fertilizer too. Even the best-laid gardening plans can be thwarted if the wrong plants occupy the wrong spots. Are you interested in bright flowers capable of blooming for one season? Look for annuals. Meanwhile, perennials appear yearly and spread once they’ve been planted. A particular flower may look nice in one location, but it won’t thrive unless its needs are met. Every variety of plant needs a certain amount of sun or shade. Study any information that comes with your newly-bought plants or seeds in order to determine their preferences. While plants need food, they also need water. Different varieties also require different amounts of water. To make things easier on yourself, group plants with similar needs when planning your garden. Furthermore, certain spaces require smaller plants while others require bigger varieties. Determine the size of adult prospective plants before purchasing. To improve your chances of gardening success, plant varieties native to the local climate and environment. There’s a perfect plant for every type of environment, so happy hunting! When the right species and spaces have been determined, it’s time to think about timing. The ideal time to garden is in the spring, since that season is neither too hot nor too cold for plants. Depending on the variety and location, a flower may need to be planted anytime from February to July. Still, there are ways to narrow things down, thankfully. Consult a farmer’s almanac or other variety-specific information to determine the best time to plant your variety. Follow a few rules of (green) thumb to avoid sowing a variety too early in the year, which can result in frozen plants. Wait two weeks after the most recent frost before planting. Also, wait until the temperatures are consistently above freezing at night. Dig holes 2-3 inches wide and deep to plant seeds. Transplanted and potted plants first need to be watered while they’re still sitting in their containers. Next, the plant can be removed. Loosen up the root ball with your fingers. Dig a hole big enough to cover the root ball. If you have slow-release flower food, add it to the bottom of the hole at this time, pressing the food into the soil with your fingers. Place the plant in the hole then pack soil in around it until every space has been filled. As long as the stem isn’t covered, the plant should be safe, secure, and ready to grow!